Only allow adults to light and maintain candle products. Never go to sleep without first extinguishing candles. 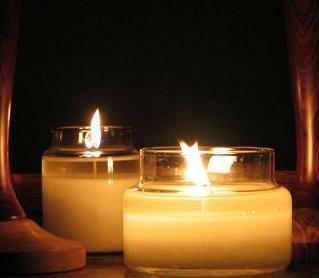 Always burn candles on a flat, smooth, even and heat resistant surface. Do not burn near open windows, vents, fans or anything that may create a draft. Flame should always burn in an even, upwardly direction and never allowed to touch the sides of containers. If flame is "flickering" relocate candle to a draft free area. Always use snug fitting holders that exceed the height of candles. Always allow containers to cool before touching or moving. When first lighting any candle, it is essential to do so only when you have enough time to fully establish a 'melt pool'. Although time varies depending on the size of container(s), melt pools are generally formed within 1-2 hours. Melt pool should never exceed a depth of 1.5 inches. Wax has a 'memory' of sorts and if, when first lit, the melt pool fails to reach all sides of the container, when next lit, the wax will 'burrow' down the center of the jar. To achieve the highest quality burn, it is our recommendation that wick(s) be trimmed to no more than 1/4 of an inch and no less than 3/8ths of an inch. Once an even melt pool has been established, extinguish candle and allow wax to solidify before re-lighting candle. When re-lighting, candles should never be allowed to burn for more than 2-3 hours at a time. Excessive trimming may cause wicks to 'drown'. 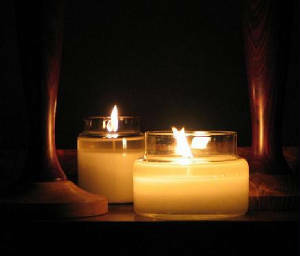 To remedy wicks that appear to be drowning, extinguish candle and with paper towel or any other absorbant tissue, remove enough liquefied wax to ensure proper wick length. Candles should be permanently extinguished when or before melted wax reaches a depth of 1/2 inch. Never hesitate to clarify instructions or ask questions of any candle manufacturer.